Wedding reception cards announce the time and venue for the celebration following your wedding ceremony, and are enclosed as part of a unique wedding invitation. Including separate reception cards as part of your custom wedding invitation is important especially if your wedding ceremony and wedding reception take place in different locations. Additionally, your reception cards set the tone for the party, giving guests an idea whether to expect a formal event or a more relaxed, casual affair. LookLoveSend offers complete sets of wedding stationery that include the wedding invitations, response cards, reception cards for weddings, direction cards, as well as wedding place cards and wedding menus. By ordering from a single, high quality source like LookLoveSend, you can coordinate your design style throughout all your wedding stationery. Customizing online wedding invitations means you can personalize each piece to create your unique wedding invitation suite. 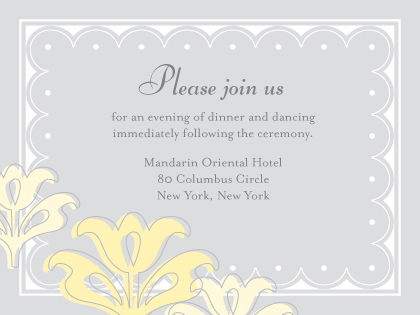 Add a photograph, a meaningful quote, monogram or insignia to your wedding reception cards. Our online customization tools–the best offered among any wedding invitation websites –are so easy to use. Of course if you need additional help, our professional customer service team is also available to you. Once you choose wedding reception cards that reflect your wedding style, in-house designers can help you with wording and fitting text. Select a font style and color option and choose your preferred paper texture. 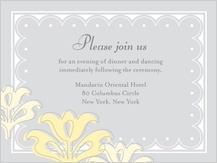 You'll receive a digital sample of your personalized wedding reception card for your approval. We'll work with you until you are 100 percent satisfied. As always, when you choose to use LookLoveSend, you are getting outstanding customer service, in-house, professional designers, and award-winning printers. We are known for our professional-quality card stock and papers, so you won't sacrifice quality for affordability. Whether you need ten reception cards or more than a hundred, LookLoveSend can meet your needs with a rapid turnaround time. See how easy it is to personalize your wedding reception cards with LookLoveSend.